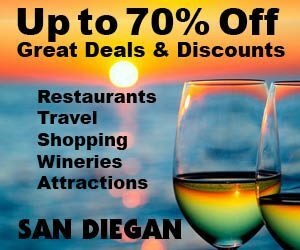 A San Diego Getaway doesn't always mean leaving town, because San Diego is a resort getaway for 34 million out-of-towners a year. So the question is getting away to where and why? More specifically for locals it's getting away to seaside cities and suburbs within fabulous San Diego or venturing to nearby regions such as Baja California's coastal regions or traveling north to romantic getaways an hour away such as Santa Catalina Island, Laguna Beach, Newport Beach, Santa Monica or Westwood. Or if it's a big change of climate it's a getaway to nearby Las Vegas.The point is that if 34 million people flock to this mecca of resort towns, why go anywhere else. So featured here are great backyard destinations that people travel half way on the world to enjoy such as the world famous Hotel Del Coronado. 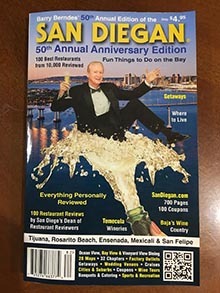 Plus, there are exclusive insider destinations that few residents of San Diego have ever heard of such as La Casa del Zorro in Borrego Springs or Rancho Valencia a tennis resort frequented by the rich and famous in Rancho Santa Fe.So whether you are a local looking for a romantic getaway or an out-of-towner looking for a wonderful place to stay, these recommendations have been personally researched. This brings in play the importance of not only where to stay but what to do in the city or suburb where the hotel is located. Thus the benefit of reading the suburb and city chapters with special maps identifying what to see and do. We have enjoyed creating these special excursions for your enjoyment. Posted August 7th, 2016 by Jake Amen & filed under Getaways, Hotels & Resorts, Las Vegas. Posted March 16th, 2015 by Barry Berndes & filed under Getaways, Hotels & Resorts, Real Estate, San Diego Family Weekend Getaways, San Diego Romantic Weekend Getaways, Uncategorized, Unique Hotels. Posted October 9th, 2009 by Barry Berndes & filed under Hotels & Resorts, North County Coastal, Oceanside, Staying in Oceanside. Posted May 15th, 2009 by Barry Berndes & filed under Hotels & Resorts, Oceanside, Vista. Located in Vista, with easy access to shopping, beaches and area attractions. Enjoy large beautiful rooms, microwaves, refrigerators, cable TV, pool, spa, picnic & BBQ area, tennis courts, putting green, complimentary breakfast and wireless internet throughout property and large vehicle parking. Two-story, 72 room, exterior-corridor property with park-at-your door convenience. Posted May 13th, 2009 by Barry Berndes & filed under Carlsbad, Hotels & Resorts, Staying in Carlsbad. The Westgate Hotel Features European Elegance at its Finest! Posted April 16th, 2009 by Barry Berndes & filed under Downtown, Hotels & Resorts. Posted April 16th, 2009 by Barry Berndes & filed under Banquets & Catering, Banquets and Catering, Corporate Meeting Venue, Happy Hour, Hotels & Resorts, Military Wedding Venues, North County Coastal Weddings, Oceanside, Oceanside Weddings, Party Venues, Rehearsal Dinners, Staying in Oceanside, Wedding Venues. Posted April 16th, 2009 by Barry Berndes & filed under Gaslamp Quarter, Hotels & Resorts, Staying in Downtown. Posted April 16th, 2009 by Barry Berndes & filed under Banquets & Catering, Encinitas, Encinitas Weddings, Hotels & Resorts, North County Coastal, North County Coastal Weddings, Restaurants, Staying in Encinitas, Wedding Venues. Posted April 13th, 2009 by Barry Berndes & filed under Hotels & Resorts, North County Coastal, Oceanside, Oceanside Harbor & Marina, Staying in Oceanside, Staying in Oceanside Harbor. Posted April 13th, 2009 by Barry Berndes & filed under Banquets & Catering, Banquets and Catering, Corporate Meeting Venue, Downtown, Downtown Weddings, Hotels & Resorts, Party Venues, Rehearsal Dinners, Restaurants, Staying in Downtown, Wedding Venues. Posted April 13th, 2009 by Barry Berndes & filed under 44th Edition OR, Harbor Island, Hotels & Resorts, Liberty Station, Point Loma, Restaurants, Wifi. Posted April 13th, 2009 by Barry Berndes & filed under Hotels & Resorts, Military Wedding Venues, North County Coastal, North County Coastal Weddings, Oceanside, Oceanside Harbor & Marina, Oceanside Weddings, Staying in Oceanside, Staying in Oceanside Harbor, Wedding Venues.